Unfortunately I'm not blessed by the lash fairies and have short stubby Asian lashes. For this reason one of my favourite makeup products are mascaras as they give me fluttery lashes and help to open up my eyes. In fact, it'd be the one makeup item I won't leave the house without (along with lip gloss and sunscreen)! Always wanting to test out the latest on the market, I tried a mascara with an interesting brush this month and have been surprised by how well it worked despite my initial scepticism. check out the teeth-like brush head! 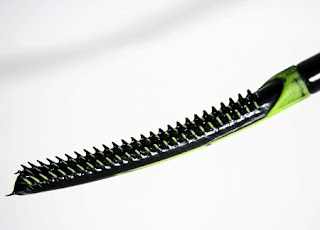 Has the weirdest flexi plastic brush design I've seen lately - the brush look like curved bow with stubby green spikey teeth but don't let this alien looking brush fool you, it works amazingly well at coating each individual lash to give defined separated looks. Not so much of a curling or volumising formula, it is slightly thick with works well with the flexible brush to really lifts lashes at the root and lengthens my short lash by more than 60% with 2 coats that is still very natural looking. Any more coats to achieve volume gave slightly stick-like lashes which had to be combed out so I would advise against going having more than 2 coats with this mascara. I didn't experience any clumping or flaking but did have slight smudging at the end of the day (I'm a serial blinker with teary eyes which could have contributed to this). If volume is not your priority and you want defined, separated and flutteringly lifted lashes, this latest Clinique mascara will meet and exceed all those requirements. I'm as pleased as punch with the results I get with it and would definitely re-purchase. RRP A$38 at Clinique counters or Clinique Online. oh really? I will watch out for that then. Have had it for just over a month and so far so good and it does give the best lengths.